The word "parsley" is a merger of Old English petersilie (which is identical to the contemporary German word for parsley: Petersilie) and the Old French peresil, both derived from Medieval Latin petrosilium, from Latin petroselinum, which is the latinization of the Greek πετροσέλινον (petroselinon), "rock-celery", from πέτρα (petra), "rock, stone", + σέλινον (selinon), "celery". Mycenaean Greek se-ri-no, in Linear B, is the earliest attested form of the word selinon. In Brazil, freshly chopped parsley (salsa) and freshly chopped scallion (cebolinha) are the main ingredients in the herb seasoning called cheiro-verde (literally "green aroma"), which is used as key seasoning for major Brazilian dishes, including meat, chicken, fish, rice, beans, stews, soups, vegetables, salads, condiments, sauces, and stocks. Cheiro-verde is sold in food markets as a bundle of both types of fresh herbs. In some Brazilian regions, chopped parsley may be replaced by chopped coriander (also called cilantro, coentro in Portuguese) in the mixture. 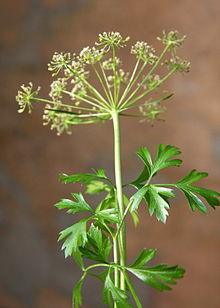 ^ "Parsley information on Drugs.com". ^ "Petroselinum crispum". Germplasm Resources Information Network (GRIN). Agricultural Research Service (ARS), United States Department of Agriculture (USDA). Retrieved 10 December 2017. Chisholm, Hugh, ed. (1911). "Parsley" . Encyclopædia Britannica (11th ed.). Cambridge University Press.